Based on one of Agatha Christie’s all-time favourite crime heroes, Albert Finney (Saturday Night and Sunday Morning, The Dresser) and Peter Ustinov (Spartacus, Topaki) take on the role of the nation’s much loved Belgian detective Hercule Poirot. The Poirot Collection brings to life three of Agatha Christie’s best-known novels, with Albert Finney marking the beginning of Poirot’s on-screen journey along with Ingrid Bergman (Casablanca) who gives an Oscar-winning performance in Murder on the Orient Express. Death on the Nile sees Peter Ustinov step into Finney’s shoes to great acclaim, and four years later reprise the role alongside some of Britain’s best-loved actresses Jane Birkin, Dame Maggie Smith and Diana Rigg in Evil Under the Sun. An elegant, all-star production starring Alberty Finney as the first screen Hercule Poirot. A no-good American tycoon lies dead with twelve dagger wounds, but which of the passengers is the guilty party? The cast includes Lauren Bacall, Martin Balsam, Ingrid Bergman, Jacqueline Bisset, Jean-Pierre Cassel, Sean Connery, John Gielgud, Wendy Hiller, Anthony Perkins, Vanessa Redgrave, Rachel Roberts, Richard Widmark, Michael York and Colin Blakely. Phew! And it's easy to forget that it was directed by none other than Sidney Lumet, and this was apparently Agatha Christie's favourite film adaptation of any of her books. A visually sumptuous and quintessentially British production, Death on the Nile won an Oscar for Anthony Powell’s costume design and saw Peter Ustinov play the Belgian detective for the first time. Aboard a luxury Nile steamer a mystery assassin takes the life of an heiress, and once again just about everyone has a motive. Ustinov is joined by Jane Birkin, Lois Chiles, Lois Chiles, Mia Farrow, Jon Finch, Olivia Hussey, George Kennedy, Angela Lansbury, Simon MacCorkindale, David Niven, Maggie Smith, Jack Warden, Harry Andrews and Sam Wanamaker. Another star-studded cast heads this Agatha Christie story of one man’s efforts to fathom the mysterious death at a resort hotel in the Mediterranean. Co-starring with Ustinov this time around are Colin Blakely, Jane Birkin, Maggie Smith, Roddy McDowall, Sylvia Miles, James Mason, Denis Quilley and Diana Rigg. 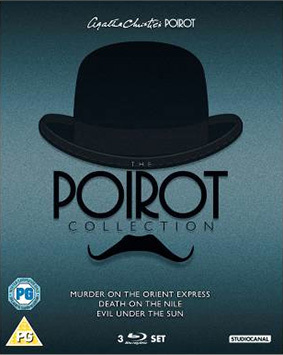 The Poirot Collection will be released on UK Blu-ray on 20 January 2013 by Studiocanal at the RRP of £34.99. No extra features have been listed, which is a bit of a shame given the names involved.